Few salads epitomize Sicilian cuisine as much as caponata, which probably takes its name from an essential ingredient (though not the principal one), capers. 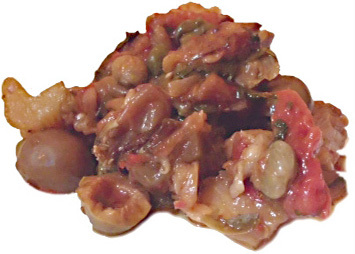 Like so much of Sicilian cuisine, caponata comes to us from the Arabs. Indeed, a case could be made that their contributions to Sicilian food, and to some extent the Sicilian language, are the Arabs' most enduring legacy in the living culture of twenty-first century Sicily. Chilled caponata, with its slightly exotic aroma and taste, is the perfect complement to the cold salads of summer, but is enjoyable year round. If somebody in Sicily offers you "Baroque" caponata they plan to sprinkle powdered unsweetened Modica Chocolate over it just before serving --an interesting touch but not welcome by all diners. Here's a basic recipe. Preparation: Cut the eggplants into chunks about one inch or two centimetres square. (You may prefer slightly larger or smaller pieces.) Do not peel. Cook these by steaming covered in a large pot until completely cooked but firm. (Don't boil them.) Drain well and set aside. Chop the tomatoes into small pieces or a thick pulp, without discarding the juice or seeds. Chop the onions into medium pieces or thin slices. Cut the celery stalks into pieces about one inch long. Discard leaves. (Many chefs prefer to cut pieces of eggplant, tomato and celery to be about equal in size.) Halve the olives. In a large pan, sauté the onions and celery pieces in olive oil. The celery should be lightly cooked, firm but not raw. Add the tomato pulp and bring the mixture to a boil, then simmer for a few minutes until the sauce changes color to a lighter red. At this point, simmer over low heat for another 4-6 minutes. Add the eggplants, olives and capers to the mixture. Also add a few tablespoons each of olive oil, vinegar and sugar. Stir gently and allow to simmer covered (steaming) for about five minutes over medium-low heat until mixture thickens but doesn't burn. Remove from heat and allow to cool. Salt to taste. Then chill for at least four hours before serving.